Includes 2 One-Piece Breastshields (24mm flange), 4 Valves, 8 Membranes, and 2 pump-in-style tubing. The tubing can't fit every model of Pump in style. Refer to the photos of this listing to find the right kit for you. Made from BPA free Materials. US FDA registered Class II medical device (No. D192499); Complies with EU Commission Regulation (EU) No 10/2011 for plastic materials that is intended to come into contact with food. Every batch is tested by independent labs (SGS, Intertech) for safety. 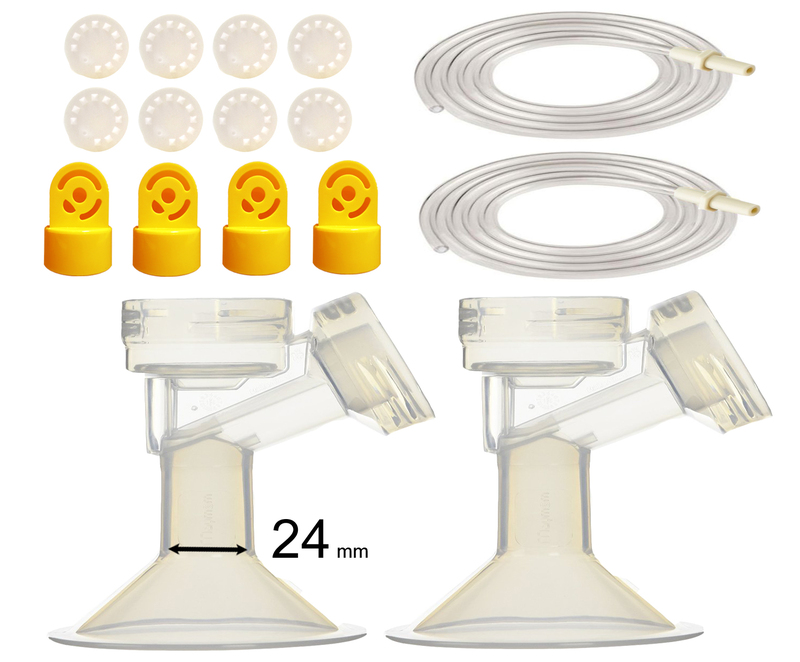 This product is designed and made by Maymom to be use with Medela Pump-In-Style Advanced breastpump released after July, 2006. The tubing has adapter on one end, and a blunt end on the other. Please refer to face plate photos before making purchases. DOES NOT include bottles. Breastshield can be connected with Medela storage bottle. Breastshield is 100% compatible with Medela valves and membranes. All items packaged retail pack, sealed by manufacturer for best protection and hygiene.